Unlike hollow steel frame members, the open-channel frame is devoid of cavities or recesses where bacteria, mould and other contaminants can breed, allowing rapid, thorough wash down with water, steam or cleaning solution, reducing the risk of cross-contamination between changeovers and providing unobstructed inspection for verifying cleanliness. To meet food, dairy, and pharmaceutical requirements, construction includes continuous welds, ground smooth and flush with adjoining members. 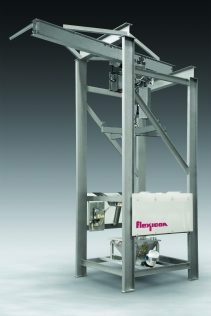 As a “BFC” model, the discharger is equipped with a cantilevered I-beam with electric hoist and trolley for loading and unloading of bulk bags without the use of a forklift. It is also supplied with FLOW-FLEXER™ bag activators that raise and lower opposite bottom edges of the bulk bag at timed intervals, promoting continuous and complete discharge of free- and non-free-flowing materials through the bag spout. The bag spout interface features a patented SPOUT-LOCK™ clamp ring that makes a high-integrity connection between the product side of the bag spout and the product side of the equipment, and a TELE-TUBE™ telescoping tube that maintains downward tension on the spout as the bag empties and elongates, promoting total evacuation. Together, the devices prevent the escape of dust throughout the entire discharging process, from untying of bag spouts to retying of partially empty bags to collapsing and retying of empty bags. BFC Series dischargers are available in over 30 configurations constructed and finished to pharmaceutical, food, dairy or industrial standards. This entry was posted in Industrial Packaging. You can post a comment.